Celebrating 90 years of service, complimented by a 150M, renovation in downtown Chicago. Easy to navigate through all meeting levels and offering the technology you expect with numerous networking spots, our meeting space totaling over 234,000 sq. ft. is stacked from the lower level to the 8th floor and provides a seamless flow with a 14 car elevator bank to easily expedite your attendees between meeting space and breakouts. Welcome to the Hilton Chicago, where Classic meets Cool. It continues to fulfill the vision of its original founder and first name sake. Million Dollar Rejuvenation, to maintain the hotel's classic integrity. to deliver the very best meetings, conventions, and accommodations experience. grandest of ballrooms in the country. room as Charles a Lindberg, and dance in the same space as Betty Davis. accommodating up to 1,650 attendees. with all the multimedia conveniences one could need. This is just one of 70 breakout rooms within the building. Fifth floors, ranging between 260 to 3,000 square feet. suites, ranging anywhere from 800 to 1,400 square feet. registration area and an office. a neighbourhood market and convenience of a side-walk cafÃ© on the go. pint when business comes to a close at the end of the day. such as our Conrad suite, the largest hotel suite in the Midwest. Grant Park and Michigan Avenue. with pool table and bar, kitchen, and 3 bedrooms with full bathrooms. Regardless of the event you're planning, you'll fit right in here. Center, for fast transport to and from the show. the Beaches of Lake Michigan. The Hilton Chicago has a long history of creating events that make a lasting impression. Our building was designed specifically for successful gatherings, whether an essential board meeting, corporate sales rally, big product roll-out, or the annual convention that drives your organization. 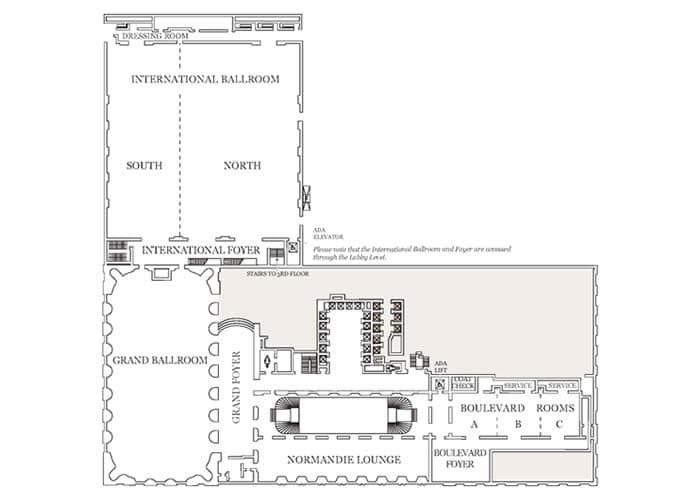 Select from the historic grand ballroom, Stevens Meeting Center, private conference rooms and spacious hospitality suites for the results you require. Steeped in history and decorated with chandeliers and mirrored accents, is an unparalleled setting for an elegant event. Our largest space can comfortably accommodate larger parties. 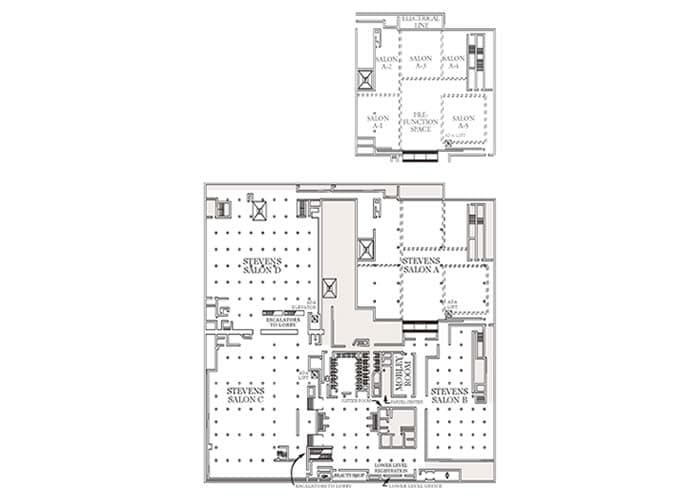 Salon A: Over 40,000 sq.ft. Salon C: Over 28,000 sq.ft. Salon D: Over 34,000 sq.ft. The Great Lakes meeting rooms-Erie, Huron, Michigan and Ontario-on the 8th floor offer 4 self-contained, column free spaces offering ample foyer space for coffee and afternoon power breaks. Executive-level meetings in our 9 distinguished boardrooms on our 5th floor provide the perfect setting for your next power meeting. You'll also find 14 recently renovated meeting rooms on the fourth floor, each one equipped with everything you need for a successful conference. The third floor is home to seven state-of-the-art rooms - perfect for small meetings to medium sized conferences. 640 sq.ft. to 1,600 sq.ft. Known for our fresh ingredients, healthy options & fair pricing. Your wedding means everything to you, and it means everything to us. Together, we'll make it unforgettable. For nearly 90 years, couples have chosen the Hilton Chicago as the place to say âI Doâ and to celebrate their new life together, whether you're looking for a majestic space â such as our Grand Ballroom â or more intimate setting like the Conrad Hilton Suite. Hilton Chicago provides wedding venues and a talented team of experienced culinary and service professionals - with an eye for every detail, who are dedicated to ensuring that your Chicago wedding celebrates your individual style while making certain your day is the experience you envision. From standard guestrooms, to executive level & specialty suites, Hilton Chicago offers rooming options for everyone. Our classic meets cool design palette provides all the comfort and technology you need with a comprehensive host of amenities. In downtown Chicago, it's never a matter of wondering what to do. It's a matter of deciding what to do. From the front door of the Hilton Chicago, you can easily reach any of the many events and attractions that will make your stay here one to remember. In addition to having access to our on-site professional event planners, you can accommodate your guests with the following tools and resources at your next Chicago meeting or event. Guests and event attendees have the ability to connect to our networks wirelessly or via Ethernet cable. From events for up to 2,400 guests to small sessions of 20, you'll find the perfect full service complements to your event including dining, suites, fitness center, massage services, business center, Fedex store and more. Take advantage of sensational group rates and value add concessions at the Hilton Chicago. Place a meeting over one of the identified Group Value Dates below and receive the following value-added offer. Recent awards, press and accolades from clients pertaining to events and happenings at the hotel. Featuring a fully equipped Fitness Center, heated indoor lap pool, seasonal sun-deck, whirlpool spas, tanning bed, and an on-site certified massage therapist, we're ready to help you stay fit on the go. At Hilton Chicago, dining options are designed with you in mind. From business brunches to pre-dinner drinks and everything in between, the options at Hilton are catered especially for you. Hilton now offers a simplified meeting package ideal for meetings up to 25 people. Recent awards, press and accolades from clients pertaining to events and happenings at the hotel. Earn Double Points when you sign up and stay at ANY hotel from September 1 through December 31, 2016. This has been our organizations second opportunity to work with Hilton Chicago and our Events Manager, we continue to be amazed by her level of service and her attentiveness to our individual needs. The 2014 Assembly could not have gone better. The Hilton Chicago team did a fantastic job. In particular, I was thoroughly impressed with the final night banquet. It was the hottest banquet food I've ever experienced.